Feudum is, in every way, a sandbox type experience. There are near limitless options for strategies and dozens of actions you can take to carry those out. As such, this will focus on the game at the highest level, but keep in mind there is a lot of nuance that may not be apparently even after the first couple of plays. Each round you will choose four cards to play. 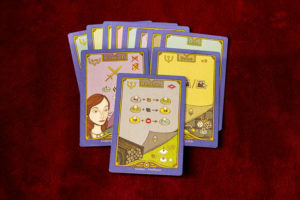 Each player is given a deck of 11 action cards. At the beginning of the round, you will select four of those cards and each player will take one of those actions in turn order until all players have played all their cards. You can spend resources to take a fifth action in a round or to take two actions in a row, or both. Move — move your pawns a number of spaces equal to the number of pawns you control. Some paths require vessels to traverse. Influence — place an influence marker in all locations you have a pawn. Only two players can influence each location. The player with the most influence is the ruler and the other player is the serf. Improve — spend resources to improve a location. An outpost improves to a farm, farm to town, town to feudum. Migrate — add another pawn to the map in a location you currently have a pawn or an influence. 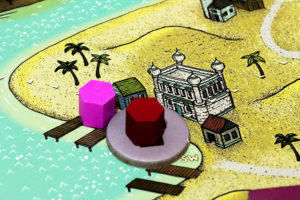 By placing pawns on the board, controlling feudums, and ruling location, you will earn status in the guilds of Feudum. 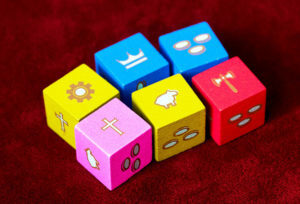 There are six guilds that match the six types of pawns. For each pawn you control of that type, you earn one status in that guild. Feudums will earn you three status. Controlling a feudum therefore is very powerful, but will require you to complete some combat to fulfill the king’s military service requirements or suffer a penalty. Each guild cares about a particular location—merchants and nobles care about towns, for instance—that also add to your status. When you influence a location you will become the ruler or the serf. If you have the most status in a guild you become the guildmaster. The player with the second-most status becomes the guild’s journeyman. Trade — any player may pay 3 shillings to purchase an available vessel. Push — the guildmaster can spend the guild’s resource to make new vessels or barrels of krud which will add influence markers to the knight’s guild. Pull — the journeyman can take resources from the merchant and add them to the alchemist’s supply. There are additional action cards that are specific to different pawns available that can earn you money, generate resources, or draw cards for additional end game scoring. You can also engage in combat, attacking other players’ pawns of feudums. Combat is fairly infrequent, but often necessary if you control a feudum to prevent you from losing points for not fulfilling your military service requirements. 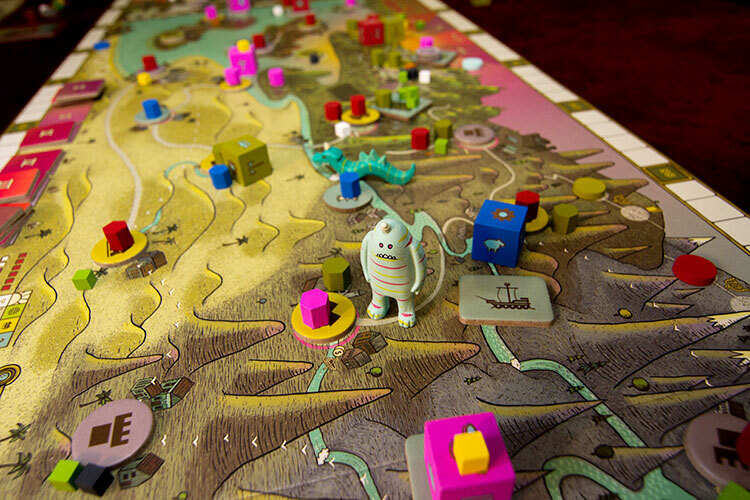 The game plays out over four action rounds and a final scoring round, which Feudum refers to as epochs. At the end of each epoch, players score points based on their guild membership and the number of different regions in which they rule a location. After the end of the 4th epoch there is some additional scoring that takes place the player with the most points wins. Monsters can be used to attack other pawns or feudums. My excitement with Feudum, if charted, would almost certainly look like a perfectly inverted bell curve. The game’s production is beautiful. The components are high quality and varied in colors and shapes. The artwork is quite literally a work of art; you could hang the game board on the wall and be proud to display it. While setting up for my first game I was giddy with excitement. Each of your pawns can be migrated as the character type of your choice. Then I began the process of learning the rules and subsequently teaching the game. 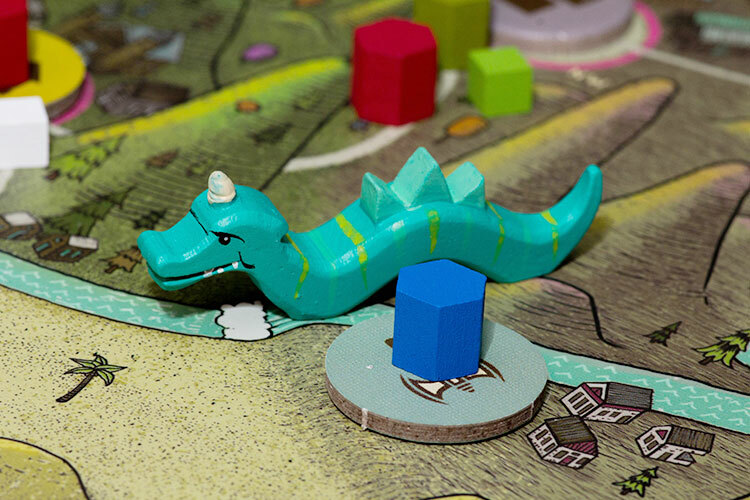 Feudum is a bear to learn and even harder to teach. It requires a lot of patience and very attentive players. I’ve taught Feudum to two different groups, both full of experienced gamers, and each teach took a little over an hour to teach. The open world style here means there isn’t a lot of direction to go at the beginning and after dumping an hour’s worth of rules on folks, they are still going to feel like they have no idea what to do. Yet as the game progresses and it all starts to come together, my enjoyment of Feudum continued to grow. You can control the knight’s guild and try to limit the amount of influence people can gather. Or control the merchants and amass a small fortune as players pay you for resources. You can focus on farming and getting as many resources as possible to take more actions than everyone else. Improving locations will also score you points and give you tiles that can become landscapes for your serfs to work. Resources must be spent to feed your pawns and improve locations on the map. There are a few sources of recurring points—guild membership, number of regions you rule a location in, and landscape tiles that you can build for serfs to work. You have to keep them in mind and make sure you don’t forget to score points between epochs. But these requirements can be met in a variety of ways; essentially they are an effect of the strategy you choose to carry out, not the driver of what strategy you choose. 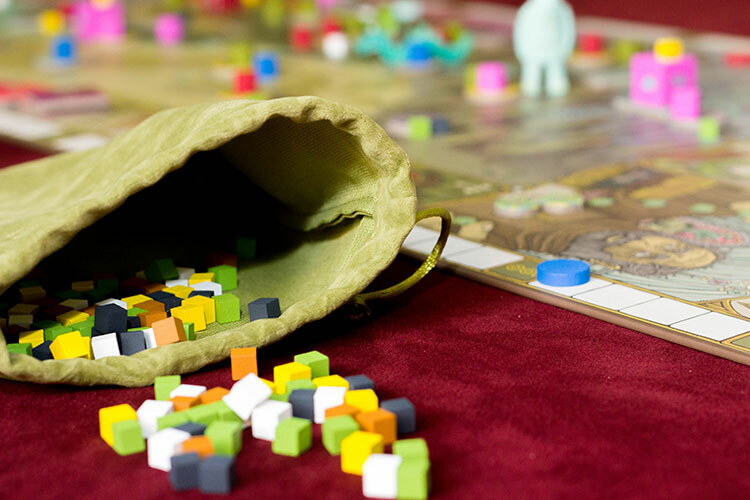 Feudum is undoubtedly a hard to learn game but that burden isn’t how to score points—that is relatively easy to understand. You just have to figure out how to use those 11 action cards to do so. 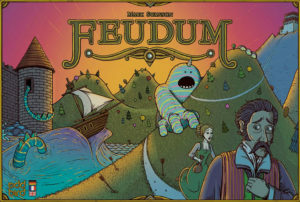 I would be remiss to not mention one other downside to Feudum. While the artwork is really fantastic, it gets in the way of the gameplay way too often. The routes between locations can be difficult to decipher. Sometimes the roads curve in and out of hills, making connected locations appear to not be connected. Some routes can be traveled by multiple types of vessels and you may have to break out a magnifying glass to know if your boat can or can’t travel through a given path. The various regions are also difficult to distinguish as the color changes are subtle and there is a bit of a gradient near the borders. None of these are unworkable, but for a rules-heavy game it can add to some frustration for the players. The sea serpent can move along the boat and submarine paths between locations. There have been a lot of board games described as “sandbox” or “open world” which are terms I often associate more with video games. Considering board games have a lot of predefined rules, paths, and options, it has been hard for me to really connect with a board game in the same way. Those that try are often full of random events. Feudum, for me, is the first game that seems both like a euro style game and a sandbox game all at the same time. The rules are numerous. None of them are overly complex by themselves, but add up to quite a lot. There are 11 action cards, most of which have multiple actions on them. And the guild action can represent 18 different actions itself. Feudum is a new level of design where the terms are laid out but you really do feel free to explore strategies that are wholly different than things you have ever tried in previous games. And I still want to keep getting Feudum back to the table. I just don’t want to teach it ever again. Final Score: 4.5 Stars – An open world game that I want to play again and again. But just with the same group so I don’t have to teach it ever again. • You’ll want to try everything the game has to offer. • Lengthy and difficult teach. • Graphic design can get in the way of the gameplay. Thank you for this review! I feel like many of the early negative reviews were based on initial impressions, but seeing comments from people on various forums disputing those reviews left me a bit lost. You did a great job describing a game that sounds like it is a rewarding challenge to learn, and that gives me much more to consider when thinking if I should purchase it. Thanks Paul, glad you found the review helpful. 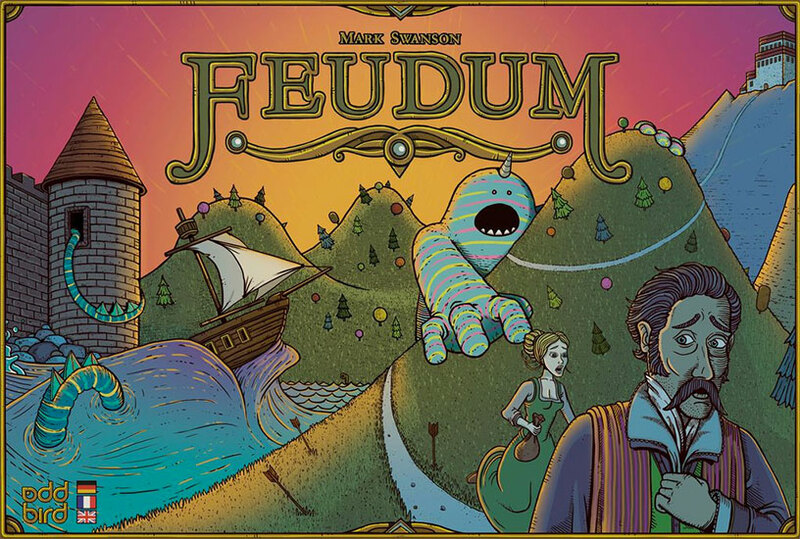 I’m not surprised there are plenty of folks that don’t like Feudum, its openness can certainly not work well for certain gamers. It is quite a personal preference but its something I find very engaging. Yeah I’m going to steer wide of this one. Looks great but good god it’s convoluted. I just purchased this one and your review makes me both excited to try it and terrified it will be like one of my other favorites – Kanban – which is a beautifully complex Euro, but man, so many things going on it’s really a bear to teach. Well let me say that you at least have impeccable tastes as Kanban is far and away my #1 game of all time.